It’s not often a two and half hour sub titled art house movie set in a Stockholm art gallery can hold you fixated but this one does. Claes Bang plays Christian the senior curator, a man with good looks, style, and charisma, at ease in the comfortable world of the arts he inhabits. The film explores this side of his life, avoiding the common mistake of preaching to the audience, and introduces his character in a gentle manner. As a result we see that Christian is successful, has a nice lifestyle, and he drives a Tesla - a statement of his position and his green credentials. Christian has some flaws but on the whole he is also a likeable person. Throughout Christian is seen as well-meaning but as the film progresses the detachment of his existence, as it collides with the real world most mortals live in, becomes ever more apparent. The critical examination of his character is more about his response to a minor crime which leads to a succession of hilarious set pieces as he encounters life on a rough estate, an indignant and intimidating migrant child and a crazed ape man type exhibit from the gallery. A nice sub plot with Anne an ape owning journalist played by Elisabeth Moss (Mad Men) makes a light hearted but serious point about the behaviour of men in powerful positions towards women without spoon feeding the viewer. The centre piece - and the biggest belly laugh (yes - laugh out loud funny) is a video made for YouTube Christian mistakenly authorises in order to promote an exhibition at the gallery. The video clip goes viral – mainly because it manages to offend everybody in Sweden. The long running philosophical debate about what is art is considered with humour, there is a long running gag about an installation that consists of a pile of ashes. Our darker side is brought into sharp focus in the ape man scene which makes uncomfortable viewing as it brutally analyses both the herd and the wolf pack aspects of human nature. The film is relentless in using humour to expose some of the absurdities of the politically correct straight jacket Swedes have to navigate as part of their daily lives. A very topical scene set at a gallery press conference has a journalist making a very much needed point about free speech - even if it offends, the cowardice of Christian and the board of directors he represents is exquisitely dissected. If none of this convinces you then the show case interview with the artist Julian Gijoni played by Dominic West (the Wire) is worth the entire film. In front of adoring art lovers Julian has to contend with someone with Tourette’s syndrome in the audience and here the movie pulls no punches, yes, the condition can be bloody hilarious in certain circumstances, people laugh - oh yes we do. The Square is a refreshing much needed antidote to the stifling dogma of political correctness, it is unafraid to make jokes about immigration, disability and poverty but does so not in a cruel sense, the joke rather is about us and our unwillingness to articulate our private views on difficult subjects. Where the film stands out is that it does not sidestep, instead it allows the characters to crash headlong into controversy. If you have some free time this Easter weekend and fancy seeing something imaginative and thought provoking yet totally bonkers then I highly recommend this movie. 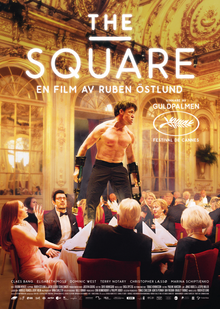 The Square, directed by Ruben Ostlund, Magnolia Pictures, 142 minutes.